The Racetrack Playa in Death Valley National Park has puzzled scientists and tourists alike for decades. Anyone who has been to this location can attest to the mysterious nature of the lakebed. The Racetrack is a large dry lake that is surrounded by rocky slopes, from which loose rocks eventually find their way onto the playa. Behind these rocks, some weighing as much as 700 lbs, are long trails entrenched into the flat muddy surface (Figure 1). These trails are often synchronized among many rocks for hundreds of meters and they can sporadically make high angle turns or even reverse in direction. Scientists have been trying to figure out the forces that cause these movements since the 1940’s, but never has the movement of the rocks been understood or directly observed – until recently. Figure 1. 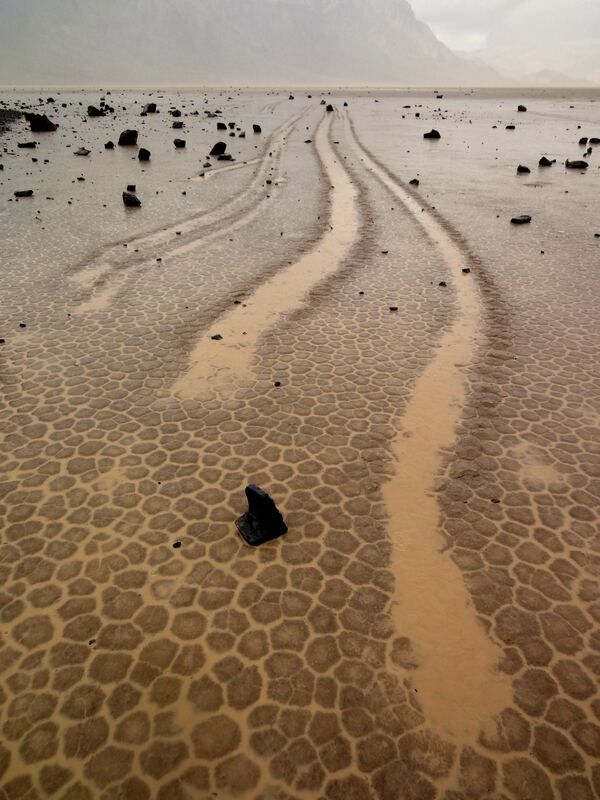 Mysterious trails left behind rocks on Racetrack Playa. Photo by James Norris. A few years ago, cousins Richard D. Norris and James M. Norris sat on the deck of their cabin here in the Granite Mountains and schemed up a plan to catch this movement on video. They first established a weather station (on loan from the Center) at the Racetrack, which allowed them to record wind speed at 1-second intervals, along with temperature, insolation, and rainfall at the playa. They also outfitted 15 non-native rocks with motion-activated GPS units (Figure 2), once activated the units recorded continuously. These GPS units were custom-built by J. Norris and his engineering partner, Jib Ray. The combination of these instruments allowed the team to record the timing of rock motion, their velocities, and the meteorological conditions required for such an event. The Norris cousins, Jib, and a crowd of friends and relatives formed the “Slithering Stones Research Initiative” and waited for their plan to work. Figure 2. 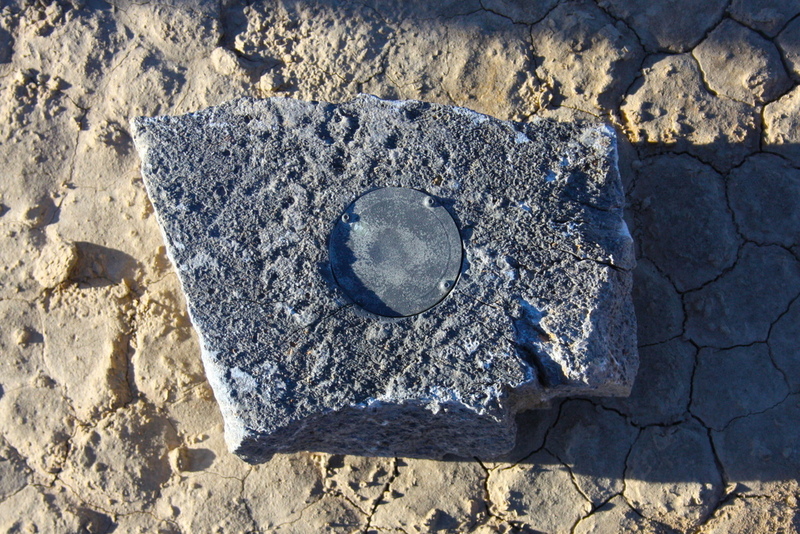 One of 15 rocks outfitted with a motion-activated GPS unit (metal disc in center of rock). Photo by James Norris. In late November of 2013 the playa received 5.64 cm of precipitation in the form of rain and snow (Figure 3). The snow depth was recorded by time-lapse cameras set up separately by Ralph D. Lorenz (The Johns Hopkins University) ?? ?and Brian Jackson (Boise State University), who later joined the “Slithering Stones” team to write up the combined observations. The shallow pond (maximum depth ~10 cm) lasted until early February of 2014, and it also created the conditions under which the first-ever recorded observations of rock movement occurred. 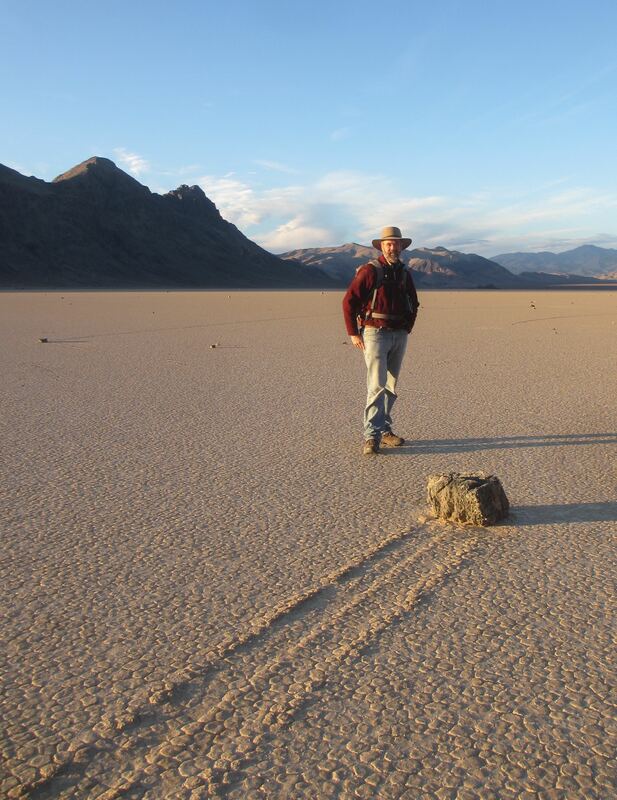 On December 20th, 2013, the Norris’ observed firsthand (and recorded on film) more than 60 rocks moving across the playa (Figure 4). Over the winter their automated instruments recorded multiple events when rocks moved >200 meters, thus providing enough data to upend previous theories for movement, such as hurricane-force winds, dust devils, slick algal films, or thick ice sheets. Instead, their data indicates that rock movement occurs under light winds (3-5 meters/second) when very thin (3-6 mm) panels of floating ice start moving across the lake. The ice sheets can push multiple rocks at low speeds (2-5 meters/minute) along trajectories determined by the direction and speed of the wind and flowing water under the ice. Figure 3. 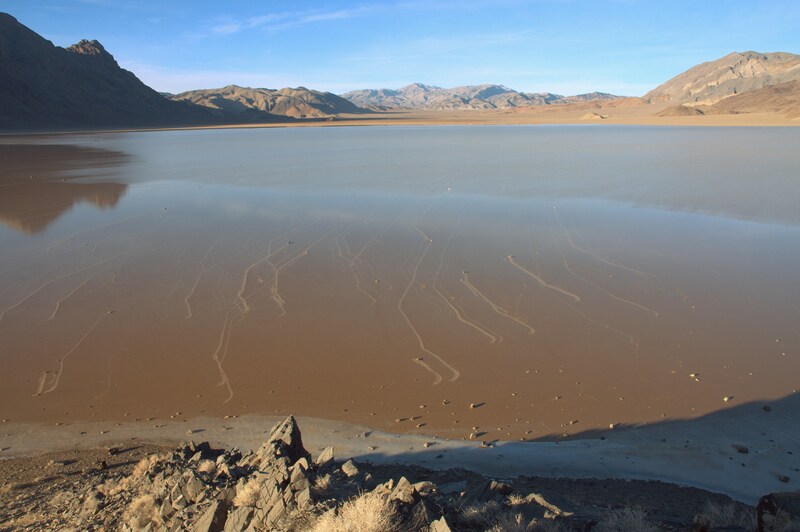 Racetrack Playa in Death Valley National Park after a winter storm left a shallow lake for nearly 3 months between November 2013 and February 2014. Examples of synchronized tracks found behind stones are shown. Photo by James Norris. Figure 4. Richard Norris standing on playa next to one of the GPS-rocks that moved during the winter of 2013. Photo Theresa Norris. This incredible discovery was published in the journal PLOS ONE on August 27th, 2014. Within days, news of the solved mystery behind the sliding rocks of the Racetrack Playa became very popular in the media – as witnessed by the numerous stories published by NPR, NBC, National Geographic, LA Times, Associated Press, Science Daily, and the list goes on (learn more at: http://www.racetrackplaya.org/). This entry was posted in Center News by Tasha. Bookmark the permalink.